Motosuwa Hideki is a Hokkaido farm boy who fails his college entrance exams. He moves to the big city to attend cram school in the hopes of getting into the college of his choice. While there, he notices that everyone has a personal computer assistant, or Persocom...and Persocoms look, act, and are treated almost as people in their own right. Hideki seems to be the only man in Tokyo without one, and bemoans his fate, as Persocoms are very expensive, and Hideki is very broke. As chance would have it, Hideki finds a "broken" Persocom just lying in the trash. When he starts her up (and oh boy is it a her), all she is able to do is mimic Hideki's movements and say, "Chii." So that's what he calls her. Is Chii really broken? Or is she quite possibly the greatest Persocom ever made - a truly artificial intelligence known as a Chobit? First off, I will say that I'm a big fan of the manga. 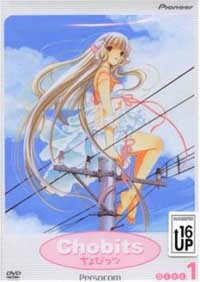 The Chobits storyline is probably one of the best that CLAMP has ever come up with. Having said this, I think that Chobits the anime came out about a year too soon, for it doesn't do the manga any sort of justice at all. On the surface, Chobits has the makings of an instant classic, and it is very popular among both Japanese and American fans. Hideki is a pure-hearted, bumbling, hilarious male lead, and makes for a great protagonist. He is unique in CLAMP series, because he's an adult male who is not a tragic hero, and not a precocious boy or angsty teen. And everyone else in the cast is believable, realistic, and likable. There's only one character in the show that just doesn't have any personality at all. Unfortunately, she's the main female lead, and she's not supposed to have any personality, at least to start with. That's right, I'm talking about Chii. Whereas the manga version of Chobits concentrates more on Hideki's point of view, with him finding out Chii's secrets, the anime is Chii, Chii, and nothing but Chii. Now, if it were more about Chii finding out facets of her personality, basically a retelling of the manga from her point of view rather than Hideki's, this would be fine. Instead, three-fourths of the series is devoted to watching Chii do cute little things. "Ooh lookie, watch Chii go buy underwear. Ooh lookie, watch Chii sell goodies at a bakeshop. Ooh lookie, watch Chii go to the beach. How cuuuuuute." It's pointless, and they waste too much time on filler episodes like this. There wasn't filler in the manga - but they started the anime when the manga was barely three or four volumes in. Though the anime has already finished, the manga isn't even half way through, and therefore it's impossible for the anime to be faithful to the original concept. And that's a shame. Even worse, the pacing is painfully slow to accommodate the lack of actual content that the show has to provide. It's not until over half the series is over that the main plot comes back into play, and then it's rushed towards the end in a vain attempt to play catch-up. If anything, they probably should have either waited a year to start this (for more source material) or stretched it out a year to compensate. Instead, we get too little, too late. I probably would've liked Chobits a lot better if I hadn't seen the previous year's Angelic Layer first. While the situation was similar (near simultaneous manga and anime release), the execution of the Angelic Layer anime was much better because they used the anime to flesh out the characters and to complement the manga. The Chobits anime actually detracts from the manga because it muddles the main storyline and feels more like a cutesy alternate universe, removing all the drama and tension that should be there. I pick up the manga and can't get enough of it. I watch the anime ...and it's a chore to make it through one episode. I know that no matter what I say, Chobits is on its way to being the Next Big Thing. This review isn't going to change that. To be honest, I don't want it to. This series has some genuine entertainment value. I don't regret watching it, and there are some characters I truly adore. But I think I'm going to stick to the manga instead.